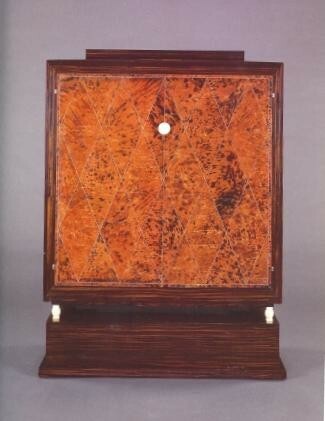 An exceptional cabinet in Macassar with a Burl Elm interior and front in Tortoise shell in diamond pattern. The chest sits on top of a matching Macassar platform, supported by ivory egg shaped feet at the front. Inside are nine compartments which have Sycamore edging to define their shape.